Researchers compacted Mars simulant under pressure in a cylindrical, flexible rubber tube. This is what the result of the experiment looked like before it was cut into bricks. Explorers planning to settle on Mars might be able to turn the planet’s red soil into bricks without needing to use an oven or additional ingredients. Instead, they would just need to apply pressure to compact the soil—the equivalent of a blow from a hammer. These are the findings of a study published in Nature Scientific Reports on April 27, 2017. The study was authored by a team of engineers at the University of California San Diego and funded by NASA. The research is all the more important since Congress passed a bill, signed by President Donald Trump in March 2017, directing NASA to send a manned mission on Mars in 2033. “The people who will go to Mars will be incredibly brave. They will be pioneers. And I would be honored to be their brick maker,” said Yu Qiao, a professor of structural engineering at UC San Diego and the study’s lead author. Proposals to use Martian soil to build habitats for manned missions on the planet are not new. But this is the first that shows astronauts would need minimal resources to do so. Previous plans included nuclear-powered brick kilns or using complex chemistry to turn organic compounds found on Mars into binding polymers. Digitally reconstructed brick before strength testing. The brick is made of Mars soil simulant compacted under pressure. 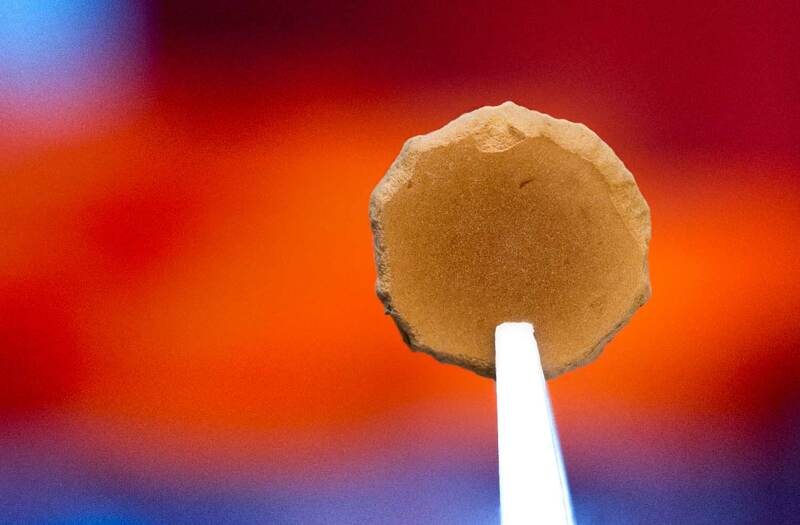 In fact, the UC San Diego engineers were initially trying to cut down on the amount of polymers required to shape Martian soil into bricks, and accidently discovered that none was needed. 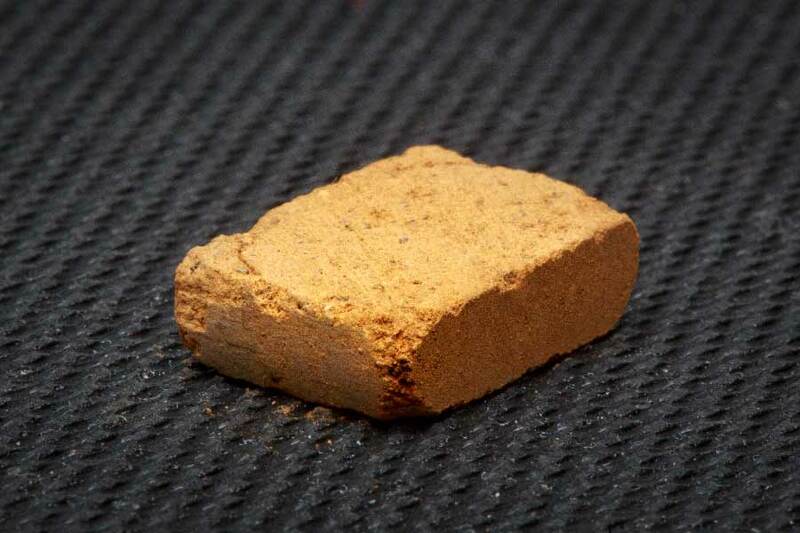 To make bricks out of Mars soil simulant, without additives and without heating or baking the material, two steps were key. One was to enclose the simulant in a flexible container, in this case a rubber tube. The other was to compact the simulant at a high enough pressure. The amount of pressure needed for a small sample is roughly the equivalent of someone dropping 10-lb hammer from a height of one meter, Qiao said. The process produces small round soil pallets that are about an inch tall and can then be cut into brick shapes. The engineers believe that the iron oxide, which gives Martian soil its signature reddish hue, acts as a binding agent. They investigated the simulant’s structure with various scanning tools and found that the tiny iron particles coat the simulant’s bigger rocky basalt particles. The iron particles have clean, flat facets that easily bind to one another under pressure. Researchers also investigated the bricks’ strengths and found that even without rebar, they are stronger than steel-reinforced concrete. Researchers said their method may be compatible with additive manufacturing. To build up a structure, astronauts could lay down a layer of soil, compact it, then lay down an additional layer and compact that, and so on. The logical next step for the research would be to increase the size of the bricks.